Using a paint sprayer is a lot more effective than using a roller. It saves you time and effort. More importantly, it provides a better-quality finish than any roller would. 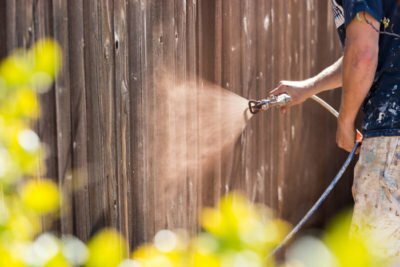 The professionals use paint sprayers and with budget-options available, you can save money on hiring an expert by doing-it-yourself. 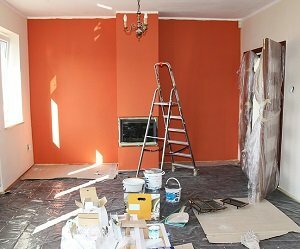 In this article, I am going to explore the best paint sprayers for interior walls. First, I will start by looking at the different types of products. We’ll explain which type of sprayer you should use. Next, I’ll analyze which type of sprayer is the best for interior walls. Then, explain how to use the paint gun to get that even, quality finish. Finally, I’ll review the 8 best paint sprayers for interior walls. A high volume low pressure (HVLP) spray gun is used for applying lacquers, varnishes, stains, and paints of all kinds. It is normally connected to a turbine motor that drives a high volume of warm air under low pressure into the gun. Instead of water, the gun shoots air mixed with paint or another substance. The escaping air atomizes the paint, spreading into droplets which provide the thin, even layers on the surface. The HVLP gun was designed to replace the conventional gun. The conventional gun had no way of regulating air pressure. Paint would shoot out at force, causing overspray and blowback. With so much waste from a conventional gun, an HVLP gun provides a more economical, less messy alternative. An airless sprayer pumps paint at a very high pressure: up to 3,000 psi. The tip breaks up the paint evenly into a fan-shaped spray pattern of tiny droplets. You can use different tips to spray thin liquids such as stain, lacquer, and varnish, or thicker liquids such as latex house paint. 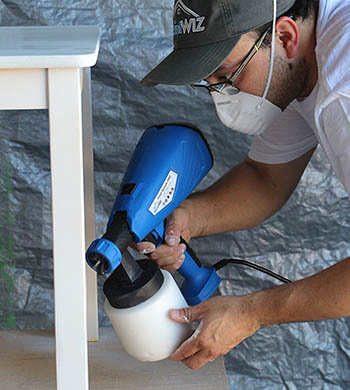 The airless spray gun uses either a cup or 5-gallon tank. This is great for large projects, such as walls or 300ft long fences, that require lots of paints evenly spread out with an excellent finish. It also works well on large indoor areas, as I will show below. There are also smaller handheld paint sprayers available on the market. They are traditionally electronic and perfect for small projects, like spraying a cabinet or even a garage door. They spray acrylics, stains, enamels, latex, primer, and solvent or water-based paints. Normally, they will be airless, so the same principles apply. The cup size will be smaller but should cover for smaller jobs. Firstly, smaller handheld paint sprayers are not up for the job. You will probably be constantly reloading your cup with more paint. This will take up time and effort. HLVPS are not great either but can work for touch-up jobs or small walls. They are good for fine production, but not for high production. You must thin your paint down your paint too. The higher atomized air leads to more overspray, causing more mess. With little control over the air pressure, you cannot control the amount of paint sprayed. They do provide great assistance when touching up small areas of interior walls so I have included the best options in the reviews below. Airless sprayers operate at both high temperatures and high pressure. Quality brands such as Graco and Titan have improved technology and these machines are completely safe. Due to spraying out 0.5 gallons of paint per minute, it is extremely effective for large, flat services, like interior and exterior walls. As HVLP is better for a small project, I recommend using an airless sprayer. For the purpose of the article, we’ll be reviewing airless paint sprayers and some of the best alternatives in hvlp and handheld. Firstly, you want to prepare to paint. Cover everything you don’t want to be painted. Everything. This means all your furniture and electronic appliances. Also, cover your walls using painter’s tape and a plastic cloth. Cover floors with canvas paint tarps. To start painting, you want to prep the paint. Strain it from the original bucket into a large, clean plastic bucket. Use an approved paint strainer to remove globs. Make sure you’re wearing disposable painter’s overalls. Paint will not come out of clothes easily. You want to also wear goggles that seal around the eyes and a full face mask fitted with a chemical filter. Transfer your strained paint to the cup or tanks fitted to your spray gun. It is highly advisable to consult the spray gun’s manual for instructions on how to do this. Get a large scrap of cardboard or plywood and test out the spray gun. Adjust the pressure nozzle until you get an even spray. Hold the gun at least 12 inches away from the surface you want to be painted. Use even side-to-side (or up-and-down) strokes to cover 3 to 4 feet at a time. When spraying make sure you’re applying multiple thin coats, instead of one to two thick coats. Note: make sure to clean the paint sprayer and tips between each layer of paint applied. Use paint thinner or another solvent as instructed by the manufacturer. The 262800 X5 allows fully adjustable pressure to give you control over the amount of paint you want to use – thus saving waste and money. No need to thin the paint, as this sprayer comes with a stainless steel piston pump. The tube allows you to spray from 1 or 5-gallon tanks. Easy cleaning as the PowerFlush adapter attaches to a garden hose. With up to 75ft of paint hose, you can easily reach your project. When clogged, the RAC IV SwitchTip allows you to reverse the tip when clogged. I like the x5 because it ticks all the boxes. Its powerful, easy to set-up and clean-up, and the finish product is always spot on. The 257025 project painter is similar to the 262800 x5 model. However, it’s hose is 50ft. It’s recommended annual use is 50 gallons and it only sprays .24 gallons per minute, compared to .27. It is lighter, weighing at 10 lbs but still boasts its fully adjustable pressure, stainless steel piston pump, and PowerFlush adaptor. The SwitchTip to prevent clogging is included as well as the ability connects to 1 or 5-gallon tanks. If you’re looking for a cheaper, lighter alternative to the 262800, and don’t mind less hose, the 257025 is for you. The 1700 PRO has High-Efficiency Airless technology to provide better productivity compared to traditional airless paint sprayers. This technology decreases overspray by up to 55%. With a softer spray, users have more control for a more consistent finish. The Sureflo Pusher Valve ensures priming every time. The sprayer operates at 1500PSI. The .60 horsepower pump is durable long-lasting use. The PRO version of Titan is a newer model and the flaws from the previous Control max have been fixed. The main improvements are the easy moveability despite being a heavier version. The 518080 is a compact, lightweight spray gun great for hard to reach areas. As a result, the cup is small. With flow trigger dials, you can control your spray pattern width from 1 to 10 inches. Sprays latex, lacquers, stains, and oil-based paints. Less overspray with its air pressure control. The hose is 20-foot long. Variable control flow allowing you to choose between spraying large areas to finite details. The sprayer comes with a small air compressor built-in and is my go-to gun for smaller, touch up jobs or difficult to reach areas. The Wagner FLEXiO 590 Sprayer uses patented technology to spray undiluted paint. It’s great for small projects and fine finishing. Depending on your project size, you can adjust the flow rate of coating speed. It’s great for small projects and fine finishing. Depending on your project size, you can adjust the flow rate of coating speed. Within 1-5 minutes you can spray an 8ft by 10ft surface and spray up to 8 gallons per hour. For durability, the iSpray nozzle is designed without wear parts. The nozzle also provides up to 60% more airflow to provide smooth, professional coverage with any coating. Compared to other sprayers, the X-Boost turbine generates 3 times the power. The W-77 spray gun has a built-in air adjusting valve perfect for medium to large size painting jobs. Excellent for automotive, home, and furniture projects. Comes with controls for more precise spraying and less waste. The stainless steel fluid needle and nozzle are corrosion resistant leading to a longer life. It comes with an extra spanner, brush, and socket. The aluminum cup holds 1000cc. It can also work with a turbine with pressures between 50-70 PSI. I really like this gun for painting skirting and trims in the home. It also works very well for touching up walls rather than painting a large room. Holds 1,000cc in an aluminium cup. The PowRyte Elite air spray gun is built to be lightweight and comfortable. The paint cup comes with no-drip technology, reducing the amount of paint loss and the excess mess made. With 3 control knobs, you can control the amount of paint sprayed, the fan pattern size, and air flow. The attached filter ensure paint is clean. The gun is easy-to-clean and comes with complete cleaning brush set and multi-wrench. Can be used for any auto paint and aswell as indoor home painting. No drip technology on the paint cup. 3 control knobs to control the paint sprayed, fan pattern size, and air flow. Comes with a complete cleaning brush set. Need to upgrade to the 2.0 nozzle to spray latex paint. The 2PG7s comes with a 2-quart pressure pot. It is equipped with a pressure gauge and a fluid pressure regulator to retain accurate settings. With 6-feet of hose, you can freely move around and operate the spray gun easily. This is excellent for spraying large areas such as buses, trucks, and vans. Works great with latex paint, although you have to thin it first. Not as good on interiors but still can get the job done if you prefer Pressure pot sprayers. 6-feet of hose to freely move around with. Works great with latex paint. Comes with a 2-quart pressure pot. Firstly, when considering to buy a paint sprayer for your interior walls, you have to consider if it is the right tool for the job. Paint sprayers can cover big swaths of space in very little time and with minimal effort. 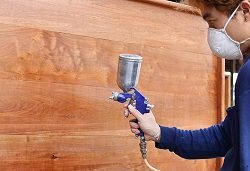 Compared to brushes and rollers, spray guns can produce a more even coat. They are also extremely useful for reaching hard-to-reach places. However, using a paint sprayer relies on a lot of effort to prep and clean up. Everything not being painted needs to be covered. The sprayer itself takes the time to clean and needs to be cleaned on a regular basis. These hidden time costs add up. In addition, the cost of paint sprayer can be expensive if you want very high-quality. Paint guns have become cheaper in recent years and they do offer an excellent alternative to hiring a professional. 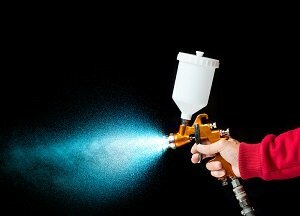 When purchasing a spray gun, the nozzle size must be taken into consideration. The heavier the paint, the thicker the nozzle you require. For example, spraying primer requires a 1.8mm nozzle minimum. For thinner materials, such as single-stage paints, metallic, and pearls, you will require a smaller tip. Also, worth noting is the difference between siphon and gravity guns. Gravity guns use less energy to spray the same amount of paint. They use every single drop of paint. However, gravity guns can be more expensive but are helpful for getting into tight spaces. A siphon gun is tougher – made of metal, not plastic – and are usually cheaper. The feed cups are normally larger, so if you’re spraying a big wall, you may opt for a siphon. Price is also a factor. The more you spend, the better the spray gun. On average, the more expensive a gun is, the more interchangeability in the nozzle components there is. You can find all-around general spray guns with a single tip at a reasonable price, but if you plan to do any more than your interior wall, you may want to invest more. Another aspect to consider when painting are windows and shutters and how to navigate these areas of your walls. Windows are simple enough and can be taped up with the trims being sprayed to look like new. If you have good quality shutters or blinds then these can be more complex. We recommend taking extra care when covering them before painting. This will avoid any damage and potential costs for replacing them. In this article, I’ve shown the best type of paint spray gun for interior walls is either an HVLP or Airless gun. Additionally, I’ve explored 8 different options for you to decide. There is also advice to help you with your purchase. Remember to consider the task at hand, the time it will take to prep and clean up the nozzle size, and the cost. All these factors will make the difference between a stressful and pleasant project. In the end, the decision is for you to make, but I hope we have covered the necessary steps and provided you with a few options to consider.